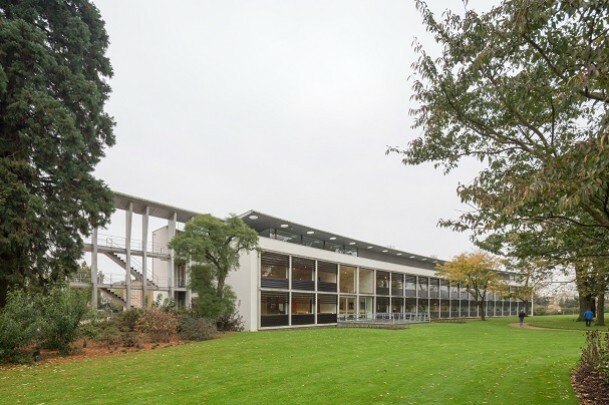 As the 1980s dawned the Agricultural University took over the building policy itself; the upshot was a spate of fresh, spunky architecture by young architects. The banana-shaped Botanical Centre was Mecanoo’s means of visually terminating the botany complex, built in 1933 in Amsterdam School style and since then regularly extended to the point of congestion. The Centre is a box white-rendered on one side and brick-clad on the other, the two portions joined by a corridor that peeks out under a canopy to either side of the building as an emergency stair. A footbridge and a connecting passage serve to tie it to the extremities of the existing complex. Two sides of the library building up front are clad in weatherboarding held between strips of glass. Since 2011 the buildings are part of Art Gallery Het Depot.